other places but never at our price. E-mail us! 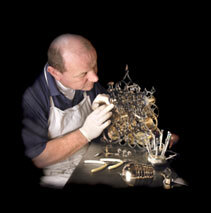 Established in 1967, Sinclair Harding honours the historical tradition of fine English clockmaking. 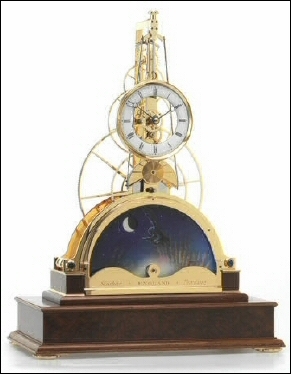 With its range of beautiful hand crafted clocks, this unique company embraces the horological industry�s ideals for precision, quality and perfection. Sinclair Harding�s craftsmen work hard to study and preserve original production techniques. The exquisite detail of each clock is testament to this skill and dedication, with every delicate stage of production carried out in the Yorkshire based workshop. Sinclair Harding�s valued clients range from private collectors to high class jewellers, and include prestigious commissions such as the design and manufacture of a 3 train chiming movement with a solid silver engraved dial for David Linley and Company�s magnificent Blenheim Bureau. 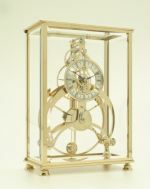 Every clock Sinclair Harding makes is lovingly crafted to suit your individual requirements and your involvement is encouraged at all stages during production of what will become a treasured heirloom. Clients are welcome to visit the workshop to appreciate first hand the trademark skill and dedication of Robert Bray and his fellow craftsmen.